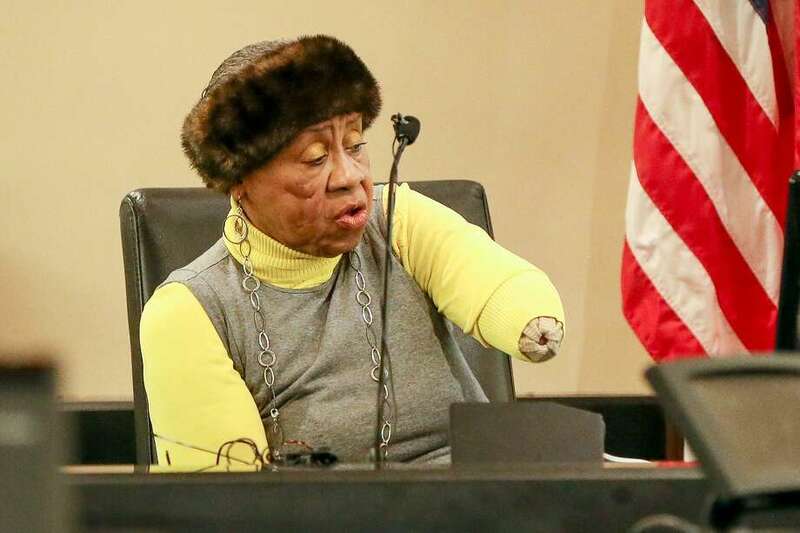 A 72-year-old woman who was attacked by her neighbors' 70-pound PIT BULL MIX told a jury Friday how she survived the ordeal. "I was fighting for my life," Doris Mixon-Smith told the jurors. Mixon-Smith told the jury how the dog mauled her on the morning of March 6 as she worked in her front yard flower garden. The dog had escaped from his owners' backyard. "I looked up and he looked like an albino dog. .. mouth was wide open and I said, I started hollering, 'Please help me. Oh God, please help me," Smith told the jurors. "He came at me with his mouth wide open." "Did his mouth make contact with your left arm?" prosecutor Daryl Harris asked Mixon-Smith. "Do you see it here, Mr. Harris?" Mixon-Smith answered, as she gestured toward her upper left arm, which was torn from her body just below the shoulder in the attack. Mixon-Smith told how a young neighbor managed to free her as she tried to get into her house. A police officer arrived minutes later and shot the dog to death. "God covered me, God covered me, and I passed out," Mixon-Smith said. The dog's owners, Alphonso McCloud and his wife, Stanyelle Miles-McCloud, are facing dangerous dog attack serious bodily injury charges. If they're found guilty, the couple face a punishment ranging from probation to a maximum of 10 years in prison. The trial resumes Monday in Judge Joey Contreras' 187th District Court. “Let go! Let go!” the boy cried in a video shown in court Thursday as he used a stick to try to stop a 70-pound pit bull named “Bully” that dragged, chewed, broke and tore at an elderly San Antonio woman’s arm until a police officer shot the dog to death.The graphic images were taken from the doorbell of Doris Mixon Smith, who was 72 on March 6, 2017, when her next-door neighbors’ pet somehow got out of its yard and attacked her — for at least five minutes — as she was gardening. Mixon Smith’s arm was severed just below the elbow, and the skin and flesh on the right side of her face was ripped and torn, from the eyebrow to her chin. Stanyelle Miles-McCloud and Alphonso McCloud, the dog’s owners, are on trial, accused of serious bodily injury and not securing the animal in their yard in a horrific case involving a dangerous dog attack in a city where roaming and loose animals are considered to be a growing problem. The child, who was not identified, cried as he hit the dog and commanded it to let go, but it wouldn’t as neighbors watched in shock. It dragged Mixon Smith and violently shook its head with her arm in its mouth. Streaks of blood were visible on her front porch on what was a sunny afternoon in the 8900 block of Mansfield on the far West Side. Once police arrived, the child was heard saying, “Don’t shoot my dog,” as three shots were fired. The dog twitched after it was shot, and the last image was of Mixon Smith’s body nearby, part of her arm missing. Before the grisly images were shown, jurors heard recordings of two chilling 911 calls from a neighbor, who can be heard frantically yelling expletives as he tried to get police and emergency medical technicians to quickly respond. “There’s a pit bull attacking a lady outside! Come help this lady right now! Right now!” said the scared caller. In the background, his children’s screams and those of Mixon Smith could be heard. In a second call, the frantic neighbor tells his children, who are crying, to stay away from the window as he pleads for police to come. Shortly after police arrive, the caller can be heard on the recording telling them, “Shoot it! Shoot it! Shoot that (expletive) thing. (Expletive. Expletive. Expletive. Expletive),” as gunshots are heard in the background. Oscar Linares, a Fire Department emergency medical technician who was one of the first on scene, told the jury he has responded to many calls for a dog bite, but that Mixon Smith’s injuries were like none he had ever seen. “The lady was lying on her back and had a tourniquet up high (on her arm), she had a left arm amputation, injuries around her face and breathing problems,” he said. Linares used a pointer on crime scene photographs in front of a projector screen behind Judge Joey Contreras to show the extent of Mixon Smith’s injuries. Linares said she was bitten “through and through on the face,” and looked as if the skin and flesh had been ripped off from her eyebrow to her chin, exposing the muscle. Her arm, severed by the dog’s teeth, left an exposed artery. 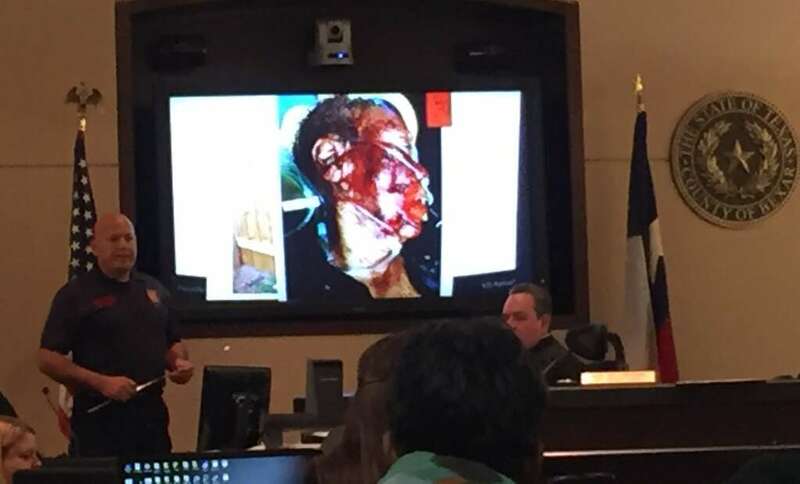 Linares, who stood in front of a projector screen behind Judge Joey Contreras, showed the jury areas where the muscle on the right side of the victim’s face was visible and where it had been torn and ripped. The pair, who pleaded not guilty, are being tried together and are out on bond. He said although the incident is tragic and “horrible,” the dog was protecting his property because Mixon Smith was known to mow the McClouds’ lawn when they had not, which a neighbor who lives across the street confirmed in testimony. Baker also told the panel that “Bully” acted out because of his memory of Mixon Smith, whom Baker said would antagonize the animal with the lawnmower each time she mowed the lawn and would park it against the fence with the motor running. Prosecutors Harris and Nicole Phillips said Mixon Smith had a history of complaining to the McClouds about their dog getting loose, and that the fence was not secured with a lock. They said the dog also had bitten at least two other people. Photographs taken at the scene by police showed a wire used to secure the inside of the gate from the backyard, and deep holes in the ground near the fence where a dog could escape. Testimony from a neighbor across the street indicated that the day Mixon Smith was attacked, no lock was on the outside part of the gate. Defense attorney Edith Brown, representing Stanyelle Miles-McCloud, waived her opening statement. Roaming animals are considered to be a growing problem in the Alamo City. Last year, Animal Care Services issued more than 11,000 citations to owners whose pets were found roaming. The agency estimates that more than 13,000 will be issued in 2018. ACS spokeswoman Lisa Norwood said there are a number of “bites” cases that occur each year, but “attack by dog” cases that cause serious bodily injury, such as in the McCloud case, are rare. She said 36 dangerous dog cases were filed in fiscal year 2017, and of those, 15 required hospitalization for serious bodily injuries. Twenty-three cases have been filed with nine requiring hospitalization for serious bites so far for fiscal year 2018. A dangerous dog attack that causes severe bodily injury is a third-degree felony, punishable by two to 10 years in prison and a fine of up to $10,000. Testimony is expected to resume this morning in 187th state District Court. Reading this makes me want to faint. I do not comprehend people that do not want to stop this type of mauling. All of the excuses, protecting its property, lawn mowers, the dog recognized the victim as the "lawn mower", is absolutely ridiculous. THERE IS NO EXCUSE FOR THIS TYPE OF ATTACK! LOSING AN ARM? REALLY? Don't shoot my dog? Nutters are really insane. Save the dog, who cares about the victim, or future victims, don't shoot my dog! Hey nutters, keep control of your ugly maulers, and we won't have to shoot them to death! The more pit bulls that get dirt napped with bullets, means there will be less victims, less chance of the mauler getting smuggled to Canada, and less pit bulls on the planet. FINE BY ME! I know this can't be a new trigger for the list, but how horrible that the victim would mow the lawn for those young, able-bodied slackers!